It was only a matter of time before I got round to this - arguably the king of all filthy foods. Although I do understand that there are pretenders to the throne coming from the world of Scottish cuisine, including deep fried pizza, deep fried haggis, and "king ribs". Perhaps a field trip is required. I wanted to get the batter right. Having failed with the deep fried pickles, I wasn't going to make the same mistake twice. I used a recipe of flour, cornflour, baking powder, milk, and beer. 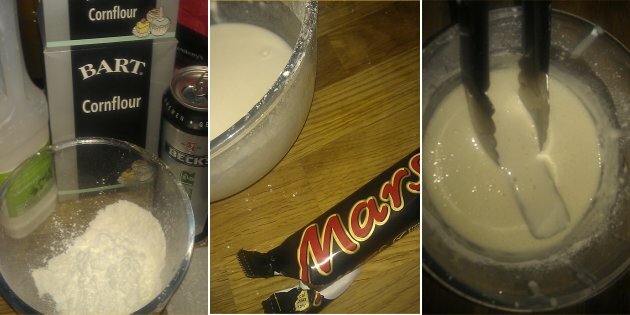 Make a nice thick batter, dip in a chilled mars bar, and plonk straight into hot oil. I knew the batter was good, as it puffed up, hardened, and went golden within a few seconds. It looked bloody brilliant. 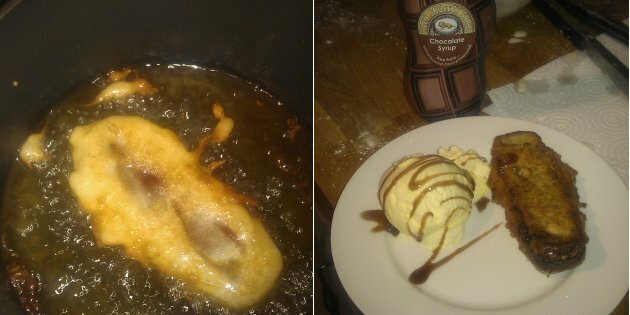 I ate it with vanilla ice cream and chocolate syrup (drizzled artistically, of course). It really does taste a lot better than you'd think. Sickly and rich would be an understatement, and eating a whole one is a bit of a challenge. But a worthwhile endeavour nonetheless. I would suggest NOT chilling it first, if you want the inside to melt and go runny - only chill it if you want the bar to remain relatively solid.